As Mesquite's little sister out of Hiedra, this female has the genetics to jump start any dark program. GTR Peruvian Alyssa is a gorgeous brown female with an excellent, crimpy brown fleece. 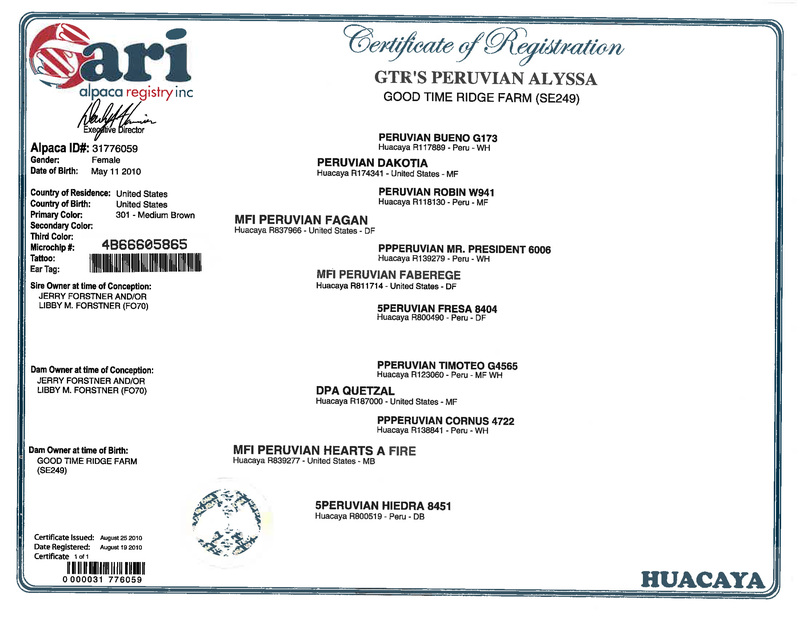 Her granddam, 5Peruvian Hiedra 8451, is the dam of the legendary black herdsire MFI Peruvian Black Mesquite, who is owned in partnership by Magical Farms and Flying Pony Alpacas. Alyssa's sire is multiple champion MFI Peruvian Fagan, the paternal brother of MFI Peruvian Jericho, sire to Majestic Peruvian Jeremiah who won both Light and Dark Herdsire of the Year in 2008 as well as Light Herdsire of the Year and Reserve Dark Herdsire of the Year in 2009! Add to this incredible pedigree males like Peruvian Bueno, accoyo PPPeruvian Mr. President and the fawn accoyo male PPeruvian Timoteo and you have a very special colored female! 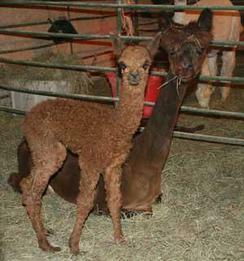 Her fleece is both dense and fine, with excellent fleece character - traits so rare for colored alpacas and do not forget she is bred to Lancaster for a spring cria and this should be one beautiful cria.